Click the button below to add the TN031 (AA 10-12mm Tahitian Black Pearl Necklace 14k Yellow gold clasp) to your wish list. Free Shipping Anywhere In Australia! Free Shipping Anywhere In The World! 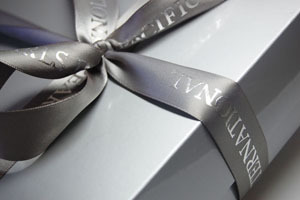 Pacific Pearls International Guarantee all our pearls are genuine , Sold to our customer around the world. Black Tahitian pearls created in the womb of the special black- lipped mollusk main found inFrench Polynesia waters also found in this warm water species naturally ranges across the central and south pacific , this mollusk naturally secretes a dark pigment, which ,depending on the quantity, gives the resulting pearl a color ranging from black to gray. (NATURAL COLOR NO DYE COLOR) Tahitian pearls generally develop a nacre coating 2-3 millimeters thick. Only a small number of oysters survive to produce a fine pearl. Luster-The lustrousness can be more subdued than in other varieties ,almost velvety, but they can also exhibit luster so intense than it resembles the metallic sheen of a ball bearing. Nacre-Very thick . During the cultivation period (about two years ), p.margaritifera produces nacre that is typically 2mm thick all the way around . peacock , the color that's often most highly valued: a dark green gray to blue gray, with rose to purple overtones . Shape- Perfectly round pearls are exceptionally rare, and even rarer in fine quality. Other Shapes are near –round, button, semi- baroque , circled …Rarity is only part of the reason for perfect round pearls' higer value . Size-Rarely less than 8 mm , the average size is 10-12mm, ( perfect round )15-17mm is considered large . 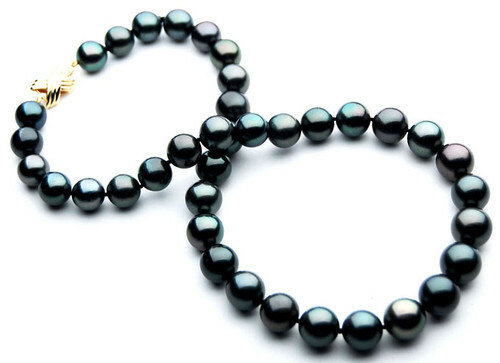 Most Tahitian cultured pearls measure between 8mm and 14mm , Occasionally , a Tahitian cultured pearl will reach 16mm , and once in a great while ( perfect round )18mm. WHAT ARE DIFFERENCE BETWEEN IMITATION PEARLS AND CULTURED PEARLS? A marketing firm reported that SouthSea Shell Pearls were inserted into a lot of SouthSea pearls as a marketing experiment and buyers could not tell the difference. SouthSea Shell Pearls are imitation pearls. They not made of wax, plastic, glass, and made in a laboratory from SouthSea oyster shells. Fine imitations today that can be very convincing. Some have actually been mistaken for fine cultured pearls.Cultured pearls are produced in bays or lakes by living in oysters or mollusks. Imitation pearls also call faux , are not created by any living creature. Imitation pearls have never seen the inside of a mollusk. They made from glass , plastic , or shell beads. The culturedpearl will have a depth of luster that the fake cannot duplicate.Use the tooth test to spot the fake. RELIABLE TEST IN MOST CASES IS THE TOOTH TEXT. Run the pearl gently along the edge of your teeth , the genuine pearl will have a mildly abrasive or gritty feel , and the imitation will be slippery smooth , Try this on pearls you will know are genuine or fake. But the tooth text may be unreliable for amateurs when applied to the imitation Majorica pearl ,Although to the trained eye they have a very different look from cultured pearls, this is an imitation pearl which might be mistaken for genuine . But close examination of the surface with a loupe will reveal a fine “pinpoint’’ surface that is very different from the smooth surface of a cultured pearl. An experienced jeweler or gemologist can quickly and easily identify the Majorica for you. 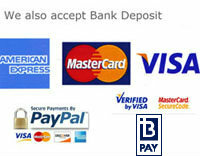 Pacific Pearls International Guarantee all our pearls are genuine , Sold to our customer around the world. Before you pay for any pearl , make sure you get what you paid for , don’t just believe what describing on the list , pearl is pearl , But, different type of the pearl have huge different value, some others sell dyed color black Freshwater pearl as natural color Tahitian black pearl , or sell cheap Freshwater pearl as quality Akoya saltwater pearl, sell round White color freshwater pearl as White Australia south sea pearl . You don’t want to pay the high price of Tahitian black pearl or Akoya saltwater pearl or Australia white south sea pearl for cheap Freshwater pearl or South sea shell pearls(imitation pearls) . 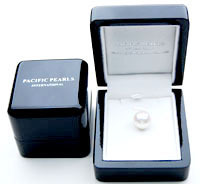 Pacific Pearls International Guarantee all our pearls are genuine , Sold to our customer around the world.